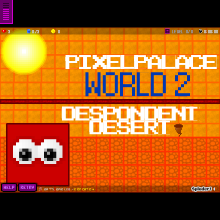 Here it is, World 2 of the PixelPalace adventure! In this game, you must survive three levels of the desert, and then you must defeat the PixelProwler in the sandcastle! However, he escapes with the PixelPrincess into a blue pipe, which leads into World 3. Anyway, have fun playing through new levels with new gameplay!